There were conflicting reports on condition of Iraqi President Jalal Talebani. 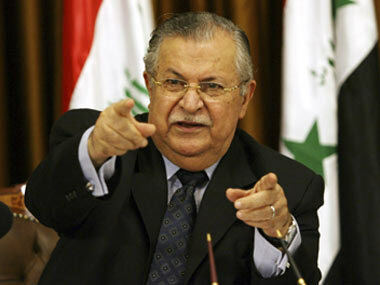 Mr. Talabani suffered a stroke late Monday and was taken to Baghdad’s Medical City hospital. Iraqi officials talking to al-Arabyia said the president was in “critical but stable condition.” Kurdish sources cited by BBC said Talabani is in a coma. Mr. Talabani is 79 years old. Aside from being the president of Iraq, he is also the longtime leader of Patriotic Union of Kurdistan (PUK), the smaller of the two major political parties in Iraq’s autonomous Kurdistan. PUK controls Suleymaniyah and its surrounding areas. There will be a number of PUK senior members who could seek the party’s top leadership if Mr Talabani would become incapacitated to serve; among them Bahram Salih and Kosrat Rasul, former regional government premiers, and Qubad Talabani, the son of the current president and representative of Kurdish Regional Government in the U.S. PUK’s leadership Council would meet if needed to name a successor. Nawshirwan Mustafa, the head of PUK’s splitter group Gorran, is also a major contender for the leadership of the region. Mustafa was a founder of PUK along with Jalal Talabani and Kosrat Rasul. Mustafa’s Gorran (“Change”) List won the municipal elections in Suleymaniyah in 2009 on an anti-corruption reformist platform. Talabani’s replacement as president of Iraq will also be at play. A Kurd is expected to get the job, but the candidate needs to have the blessing of the longtime Kurdish leader Masoud Barzani, the powerful overall leader of Kurdish autonomous region. But Barzani has been at odds with the central government in Baghdad over Kirkuk and other disputed oil-rich Kurdish territories, making a compromise with Iraqi premier al-Maliki on succession issue that much more difficult.